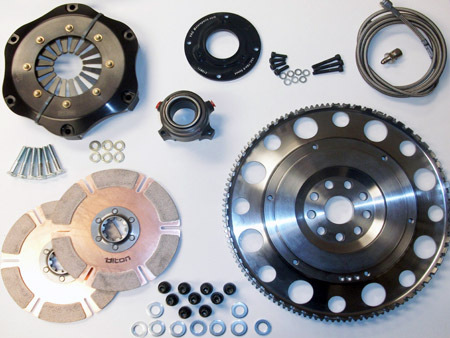 After nearly a decade of proven performance in different racing series including Professional Rally, British Touring car, SCCA World Challenge, and even street use; we are extremely confident that this is the ultimate lightweight purpose built clutch / flywheel combination kit available for your BMW engine. Our kits start by throwing away the OEM clutch and flywheel design... Starting with the finest components on the market, we engineer each of our kits to use custom, perfectly weighted (we tested) lightweight steel flywheel. This allows your engine to properly idle and trigger the ECU, while allowing instantaneous response to throttle inputs with the toughness of steel alloy construction. This is mated to our custom hydraulically actuated Titlton throw out bearing and adapter; eliminating the weak and antiquated clutch fork. Your choice of the full out racing 5.5" dual-disc Tilton clutchpack or a rally-style 7.25" clutchpack that can be used for tricky race situations like rally or targa use. Each of these offers excellent feedback combined with low effort for minimal driver fatigue and maximum left foot information when needed. VAC gen III lightweight flywheel, super-light yet tough steel! This kit offers durability, reliability, and the confidence you need during the punishment of racing and is by far the most dependable and comprehensive racing clutch kit available for each BMW platform. Note that Cera-metalic or bronze plates are very durable but aggressive. If you need to be able to slip this clutch, please see our kits with Carbon clutch units.